A historical fiction mystery featuring the working class (ala Downton Abbey)? Yeah, this sounds like a winner! Kat Holloway is a cook. She’s good enough that she could almost choose where she wants to work, though she will be part of the working class. She accepts a position at Mayfair mansion working for Lord Rankin. The family has plenty of eccentricities … but Kat knows that most of the wealthy families have their eccentricities. As long as no one bothers her kitchen, she can tolerate just about anything. But when her Irish servant, the kitchen maid, is found murdered Kat gets involved trying to solve the crime. With the help of her friend, Daniel McAdam, and Rankin’s sister-in-law, Kat gets caught up in a plot much deeper than the simple murder of a downstairs staff member. Kat and crew uncover a plot to kill Queen Victoria – which brings about a great deal of danger to the cook. This story started out really well but as the plot developed it lost its steam. What was working well was the establishing of the character(s) and the period research. I’m probably not alone in having enjoyed the Downton Abbey television series and really enjoyed this visit back to the similar period. What didn’t work was the mystery. I’m usually willing to stretch credibility to some extent, but to have a cook in a large household have the freedom (not to mention the time) to chase down a mystery (and save the Queen!) really pushes the boundaries. Certainly plausible, but it didn’t work well here. I also felt that once the mystery began, the character growth stopped. Who we met at the beginning of the book was exactly who we were left with once the story was resolved. Given all that happens, to have essentially the same character is really disappointing. This may be the first in a series, but it will be my last. Looking for a good book? 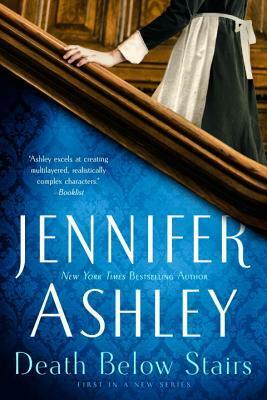 Death Below Stairs by Jennifer Ashley has a promising premise but loses its steam the further into the mystery that it gets.